Review: By the time a franchise gets around to its third sequel, there’s a definite formula that’s been developed, a ‘if it ain’t broke, don’t fix it’ vibe, if you will. As derivative as it may seem artistically, unfortunately all movie studios care about is the bottom line and as long as audiences continue to come out in droves with their cash handy, they’ll keep making the same movie over and over again. That’s what’s been so interesting about the Insidious films; they’ve all followed the same pattern and have similar beats to hit but they wind up being more entertaining than they have any right to be. After two successfully entries the series ventured into prequel territory for it’s third outing and this new film is a sequel to that prequel. 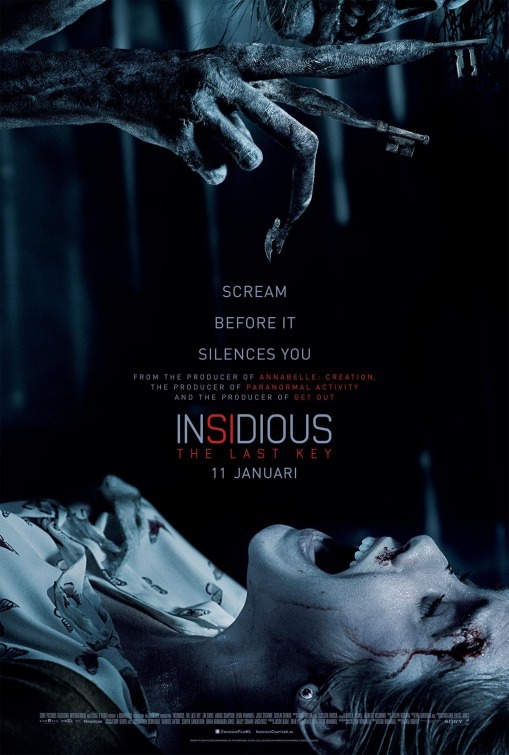 While it doesn’t tread any new ground, Insidious: The Last Key proves worthy as connective tissue from Insidious: Chapter 3 to the original Insidious (let’s just leave Insidious: Chapter 2 far out of the conversation, shall we?) and it’s largely due to supporting player turned star Lin Shaye (A Nightmare on Elm Street) appearing once more as medium Elise Rainer. The other three films have benefited from her presence but she’s truly the central figure of screenwriter and co-star Leigh Whannell’s latest episode. Opening with a prologue set in the ‘50s, we meet Elise as a child living with her parents and brother in their creepy house next to a maximum-security prison. Every time the lights flicker it’s a signal another death row inmate has met his maker via electric chair but that’s the least of the worries this family has. Elise can see ghosts and while she’s encouraged to embrace it by her supportive mother, her alcoholic father (Josh Stewart, Interstellar) fears his child that can seemingly communicate with the dead and punishes her when her gifts emerge. Charmed by an evil entity into freeing it from its basement confines, Elise unwittingly brings a malevolent force into her family which sets into motion events that will haunt her for the rest of her life. Picking up in 2010, Elise is contacted by a man now living in her old house. Strange events have started up again and she takes his invitation as an opportunity to exorcise (literally) her childhood traumas and reconnect with her brother (Bruce Davison, The Lords of Salem) who has a family of his own, including two daughters played by Magic Mike’s Caitlin Gerard and Spencer Locke. As she explores her house (always, I should add in the dead of night armed with a small flashlight and never during the day) she comes face to face not only with secrets from her past but a freaky figure we come to know as KeyFace (Javier Botet, IT). After the first two films were directed by James Wan (The Conjuring) and the previous entry directed by Whannell, I was encouraged to see a new face in the director chair this go around. Director Adam Robitel wrote and directed the real horror gem The Taking of Deborah Logan a few years ago so I was interested to see what he brought to the franchise. Turns out Robitel brings a more grounded approach to the film and while that doesn’t always work for a vehicle that’s supposed to be an all-out scare machine, his approach feels right at this late stage. These are characters we’re all familiar with, so let’s take some time to get to know them between the scares. That’s good news for Shaye who shines even when she’s navigating clunky dialogue and playing the straight man to her goofy sidekicks played by Whannell (Cooties) and Angus Sampson (Mad Max: Fury Road). Both of these oddballs provided some interesting comic relief in the first film but have steadily gotten broader with each passing entry, much to the overall detriment of any kind of mood everyone is trying to create. Davison looks like he’s thinking of what he’s going to buy with his paycheck while Gerard and Locke are passable as characters that might pick up the psychic torch from their aunt. This feels like a good way to round off the rough edges of this series that started strong, dipped, and then leveled off. It misses a few opportunities to go deeper and actually is missing creepy scenes shown in the trailer. I found it interesting that while Elise’s haunted house is next to an imposing abandoned prison, we never get a look inside the derelict penitentiary. It’s worth seeing it with a large audience that’s there to have fun. The screams at my screening were as entertaining as the film itself, especially the woman that yelled out ‘Gosh DARN it’ after a particularly nasty scare. There are a few interesting curveballs thrown in and it’s packed with enough jump scares to satisfy your post-holiday cravings. Just remember: it’s not art, it’s the fourth entry in the Insidious series.